Overlooking the old Avalon Community in a quiet rural setting is the final resting place of legendary bluesman Mississippi John Hurt. By appointment. Donations accepted. Beautiful boardwalk located north of Belzoni just off of Hwy. 7. Drive-by. An art display of 42 creatively painted fiberglass catfish. Belzoni has more outdoor sculptures per capita than any other city in Mississippi. Drive-by. Housed German POWs during WWII. Drive-by. The museum's mission is to protect African-American heritage. Group tours and family reunion groups welcome. Pottery fragments found in the surrounding area indicate the mounds date back to 1100 - 1500 A.D. Drive-by. Museum contains artifacts from Jaketown dating from about 1750 B.C. to 1500 A.D., making it one of the longest and earliest inhabited sites discovered in North America. Wed, 10 a.m. - 4 p.m. Free. Ethel Wright Mohamed is often referred to as the “Grandma Moses of Stitchery.” View over 100 stitchery memory pictures that are representative of Mississippi Delta family life. Open year-round. By appointment. Considered to be the first person to die in the fight for civil rights for African-Americans, George Lee’s name is the first of 40 listed on the Civil Rights Memorial in Montgomery, AL. On March 13, 1863, near this site, the Natchez burned and sank in the Yazoo River. Converted into a Confederate gunboat and loaded with cotton bales, the vessel had been taken into the Yazoo River to avoid capture. Called “The Delta’s Garden,” this beautiful 14-acre garden contains thousands of azaleas, roses, daylilies, a gazebo, a lake, various fowl and more. The antebellum home, the Burrus House, built in 1858 was used in the filming of the 1956 movie Baby Doll. Shotgun shacks on the premises are available to rent. Marchers, including Dr. Martin Luther King Jr., were provided food and water by church members and members of the Woods family in 1966 during a march for voting rights. Burial site of Confederate Brig. Gen. Charles Clark. Contains the graves of Senators J. Z. George and H. D. Money and their families. Both are marked with impressive tombstones. Daily, dawn to dusk. Carrollton is an interesting destination for family and friends. Schedule private tours of churches, homes and museums any time or attend the annual Pilgrimage and Pioneer Day Festival in October. This 1834 building has been a mercantile, coffin/furniture company, bank, courthouse and dry cleaners. Home of John S. McCain Family Collection and collections of toys, bottles and arrowheads. By appointment only. Two-hour tour of the late John Hurt home, museum, church, historic marker, gravesite and Old Community Store. Visit the Cotton Museum and learn about the history of cotton and the crop’s relationship to blues music. Gift shop. By appointment. Free. Collection of Mississippi pottery and artifacts. Archaeological research materials. Closed national holidays. Mon - Thu, 9 a.m. - 5:30 p.m.; Fri, 9 a.m. - 5 p.m.; Sat, 9 a.m. - 1 p.m.; Sun, 1 - 5 p.m. Free. Cat Head specializes in all things Delta Blues. Cat Head’s website and in-store chalkboard track blues shows in the Mississippi Delta. Gift shop.Tours by appointment. Mon - Sat, 10 a.m. - 5 p.m. Free. Bronze plaques, highlighting local persons of national or international recognition, are installed in sidewalks throughout downtown Clarksdale. Legend has it that bluesman Robert Johnson sold his soul to the devil at the Crossroads for the ability to play blues music. Have a picture made at the iconic marker. Blues enthusiasts will enjoy a visit to this museum, packed with blues artifacts and memorabilia. Mar - Oct: Mon - Sat, 9 a.m. - 5 p.m.; Nov - Feb: Mon - Sat, 10 a.m. - 5 p.m. After hours and Sundays, by appointment. Admission. Customized to your particular interests: blues sites, Mississippi River, oxbows, lakes, agriculture, countryside homes and churches, sunset photo ops, you name it. 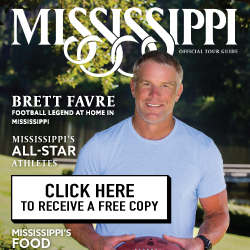 A real and personal Mississippi Delta experience. Art gallery featuring blues-related art: blues musicians, song titles, lyrics and traditions captured in paintings and objects by blues-loving artists. Works by John Fewkes, mouth painter Cindi Bernhardt and Susan Conditt. Open during festivals and by appointment. Ground Zero Blues Club features performances by both local and national blues bands and is co-owned by Oscar-winning actor Morgan Freeman. Lunch served Mon - Fri, 11 a.m. - 2 p.m. Live music, Wed - Sat. Folk and fine-art gallery owned by International Blues Festival artist Stan Street. Home of the Hambone Festival. Tue - Sat, 11 a.m. - 5 p.m. Live music, Tue, 7 - 10 p.m. Free. Walking tour of the beautiful historic district of Clarksdale including Tennessee Williams Park and historic homes. Among them is the former home of the thirty-eighth Gov. Earl Brewer. Old commissary filled with antiques and artifacts pertaining to the culture surrounding the Mississippi Delta. Features one of the first mechanized cotton pickers. Open year-round. By appointment. Free. The cabin where legendary bluesman Muddy Waters grew up was once located on the Stovall Plantation. Mississippi Blues Trail marker on site. The actual cabin is now on display inside the Delta Blues Museum. Drive-by. The New Roxy is a former movie theater located in the historic New World District of downtown Clarksdale. Vibrant music, art and theater venue. Choose a day tour or an extended tour on the mighty Mississippi River in a hand-carved canoe. Featured in National Geographic Adventure Magazine and on Food Network. No experience necessary. Authentic Mississippi Delta juke joint offers performances by Mississippi artists.Open every weekend and most weeknights. Admission. Permanent exhibit of the blues, along with rock and roll memorabilia from the 1920s through the 1960s. Permanent exhibit of the blues, along with rock and roll memorabilia from the 1920s through the 1960s. Serves as a gallery, community center and education center. Also displaying paintings, jewelry, quilting, furniture and sculptures. By appointment. Visit the childhood home of famous Mississippi native son and world-renowned writer Tennessee Williams. By appointment. Free. W.C. Handy (1873-1958), the “Father of the Blues,” lived at this site from 1903 to 1905. Drive-by. Museum is located in the building from which WROX radio was broadcast and where famous radio personality Early Wright entertained us all with his ad libs while spinning the latest records. A huge collection of everything associated with radio and music. Open during festivals and by appointment. During the Civil Rights Movement, Moore organized the NAACP and served as President in Cleveland. His home was used to plan movement operations, and he housed SNCC workers and other activists that would come through the area at his home. “A Cast of Blues” features three-dimensional, exact replicas of blues musicians’ faces. Mon - Fri, 8 a.m. - 5 p.m. Call for weekend appointments. Free. W.C. Handy MS Blues Trail Marker provides more insight into the life of this legendary bluesman, known as the “Father of the Blues.” Historic courthouse. Daily, dawn to dusk. Free. Inning by Inning: A Life in Baseball, chronicles the life of former Red Sox World Series player Dave "Boo" Ferriss from his early days in Shaw, MS to his coaching days at Delta State University. Collection includes photos and personable memorabilia, including a wool uniform, gloves and an official Red Sox vs. St. Louis Cardinal World Series pennant. Smithsonian exhibits, historical displays and changing exhibits on the Delta and related topics Thu, 8 a.m. - 5 p.m.
A Mississippi Blues Trail marker is located at Dockery Farms, home of early blues musician Charley Patton. His style influenced the development of the Delta blues. Open year-round. Free. Permanent collection includes works by Kathe Kollwitz and Salvador Dalí. Changing exhibits. Open during school sessions. Mon - Fri, 8 a.m. - 5 p.m. Free. For a truly remarkable interactive journey through the history of music, just follow the Mississippi Blues and Country Music Trails to GRAMMY Museum® Mississippi. The museum features both permanent and rotating exhibits and is a must see for everyone who loves music. Mon - Sat, 10 a.m. - 5:30 p.m.; Sun, 12 - 5:30 p.m. Closed Thanksgiving Day and Christmas Day. Admission. Located in front of the Bologna Performing Arts Center in a landscaped garden. Works of nationally known artists are on display. A self-guided tour of sites important to blues music. Brochure available from Cleveland-Bolivar County Chamber of Commerce. Mon - Fri, 8:30 a.m. - 5 p.m. Free. Quaint shopping district along the downtown greenstrip houses. Features boutiques, art galleries, cafes and specialty shopping. Located in the Historic District; features a landscaped walking trail. Mon - Sat, 10 a.m. - 5 p.m. Gift shop. Free. The museum showcases a 70’ x 17’ zero gauge model railroad layout. Also on display are artifacts, documents, photos and memorabilia. Interactive for children; fun for the whole family. Model Train runs Mon - Sat, 1 - 4 p.m.; Museum: Mon - Fri, 9 a.m. - 12 p.m., 1 - 5 p.m.; Sat, 1 - 4 p.m. Final resting place of more than 80 Confederate soldiers killed in the Battle of Shiloh. Daily, dawn to dusk. Burial site of an 18-year-old who was the first African- American to receive the Medal of Honor for heroic action during the Vietnam War. Daily, dawn to dusk. Museum with Civil War and Indian artifacts. Daily, 10 a.m. - 3 p.m., or by appointment. Admission. Features photos, artifacts and maps related to the history of the area. Located inside the Glen Allan Community Facilities Building in the Glen Allan Library. c. 1830. View the remains of one of the first churches in the Delta region. During the Civil War, the lead was melted from its original stained-glass windows to make minié ball ammunition. Later, the church fell into ruin. Drive-by. Center honors the memory of Emmett Till, a black youth kidnapped and brutally murdered in the Delta in 1955, with exhibits and related artifacts. Guided tours available. Gift shop. Tue - Fri, 10 a.m. - 5 p.m.; Sat, 10 a.m. - 2 p.m. Donations accepted. One-mile trail set along the waters of Black Bayou. Signs provide information about native plants and animals, the community's history and responses to events connected to the Emmett Till lynching. Picnic area, outdoor concert pavilion, campsite, bird-watching and photo opportunities. 108-year-old, fully restored carousel is open for rides. Sat, 3 - 5 p.m. $1 per ride. Built in 1857 for W.W. Worthington, it is the last antebellum mansion along the river in the Mississippi Delta, standing at over 9,000 square feet. After undergoing extensive restoration, the home is available for weddings, events, tours and luxury sportsmen excursions. Call for more information. The center is housed in the former E.E. Bass Junior High School, designed by renowned architect A. Hays Town and built in 1929. 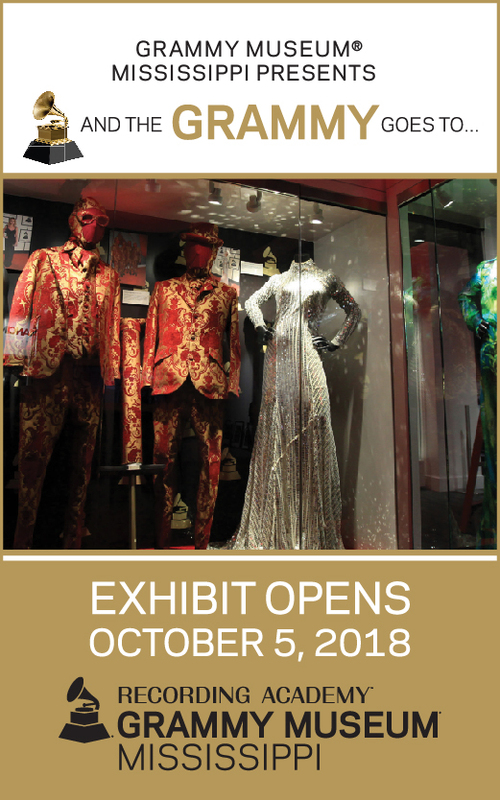 The gallery displays seven exhibits per year with one week between shows. Mon - Fri, 9 a.m. - 5 p.m. Free. Housed in the oldest structure in downtown Greenville, this museum presents the history of one of the greatest natural disasters this country has ever known. Open year-round. Mon - Fri, 9 a.m. - 5 p.m. Weekends by appointment. Drive along one of the nation’s oldest, longest and most distinctive scenic byways, which extends from the Tennessee line to the Louisiana line, allowing access to the Mississippi River. In 1927, the Mississippi River broke through the levee north of Greenville, flooding the Delta. A new levee system, taller than the Great Wall of China, was constructed by the US Army Corps of Engineers. Drive-by. From World War II to the Cold War, Greenville did its part to train the airmen and women who defended our freedom. This museum tells their story. Daily, 7 a.m. - 7 p.m. These final resting places tell volumes about Greenville’s early residents: bankers and business people, politicians, former slaves, writers, teachers, community and religious leaders and people from every walk of life. The Greenville Cemetery is home to The Patriot. This stunning tribute was commissioned by author William Alexander Percy in honor of his late father, former US Senator Leroy Percy. This museum tells the history of Greenville from the turn of the 20th century to the 1970s. Features photographs, artifacts and memorabilia. Mon - Fri, 9 a.m. - 5 p.m.; Sat, 9 a.m. - 12 p.m. The fastest track in the South. Heart-pounding, wheel-to-wheel action. Weekly racing, Apr - Oct. Admission. Showcases the River City’s many prominent writers including Shelby Foote, Ellen Douglas, Walker Percy, Beverly Lowry and Clifton L. Taulbert. Hours vary. Houses the Goldstein Nelken Solomon Century of History Museum. Temple dates back to 1906. The museum displays Greenville’s Jewish history over the last half century. By appointment. Final resting place of Bishop E.W. Lampton, the only African-American bishop from Mississippi, and Holt Collier, prominent African-America businessman and slave. Drive-by. Free. Located just blocks from the Mississippi River in the heart of the Delta, the brewery’s mission is to create beer that is rich in flavor and that flows smooth and strong like the river they grew up on. Brewery tours available by appointment. Explore the state-of-the-art tap room where visitors can taste the clean and smooth beers, shop merchandise and host events. Wed. – Sat., 5 – 10 p.m.
c. 1864; current building 1971. Established by six former slaves as the first church structure erected by African-Americans in Greenville. Mt. Horeb has been an important part of the city’s religious life. Sunday services, 9:30 a.m. and 11 a.m. Drive-by. c. 1828. Brick Romanesque Revival building on the site of the first Roman Catholic seminary for African-American priests in the US. By appointment. Organized in 1867, St. Matthew was the first AME church established in the Mississippi Delta. By appointment. Special guest appearances by blues artists, live rock bands, R&B performers and more every weekend. Dining. Blues Walk stone markers honor local entertainers and others from around the world. Features a 38-ft. observation tower for a panoramic view of the Mississippi River. One of the few locations on the river that offers camping as well as RV and picnic facilities on the banks of the Mississippi. Daily. c. 1873. Classic Victorian Revival cottage which is now the home of the Greater Greenville Development Foundation and Main Street Greenville. Mon - Fri, 8 a.m. - 5 p.m. Free. The Washington County Welcome Center, originally dubbed “The River Road Queen,” is considered one of the ten most distinctive welcome centers in the United States, with exhibits upstairs showcasing the Delta. Located near the Mississippi River, it was originally built for the 1984 World’s Fair in New Orleans then relocated. Daily, 8 a.m. - 5 p.m.
One of the largest Indian mound groups in the Mississippi Valley. Area artifacts and special events year-round. Go to website for the most current schedule of events. Free. Donations accepted. Grounds: Daily, dawn to dusk. Museum: Mon - Sat, 9 a.m. - 5 p.m.; Sun, 1:30 - 5 p.m. Trace the steps of those who fought for justice, promise and equality. Family-owned and operated since 1933 and a landmark of Greenwood, The Crystal Grill has been serving generations of locals and visitors alike. Try their mile-high meringue! From the largest Elk Clubs in Mississippi to the Alluvian Hotel, you'll notice elaborate brickwork and columns on downtown storefronts. Discover landmarks like Cotton Row, the Courthouse and Keesler Bridge. Fort Pemberton was one of the many fortifications that deterred Union boars from making their way to Vicksburg in 1863. The Star of the West remains lying in the Tallahatchie River. View fine examples of Neo-classical Revival, Tudor, Spanish eclectic and Prairie styles under the shade of 300 oaks. Contains 40 Confederate gravesites from the battle of Fort Pemberton. Dawn to dusk. Five generations and since 1933, Lusco's is one of Mississippi’s oldest, most distinctive and most storied restaurants. Eclectic local museum, founded almost forty years ago to house agricultural, archaeological, cultural and historic treasures. Mon - Sat, 9 a.m. - 5 p.m.; Closed holiday weekends. Admission. Legendary bluesman who dealt with the devil, wound up with three grave markers near Greenwood. Make up your mind about where his spirit still hovers. The statue of Mary and Child is an original work of art, in Carrara marble, by Italian sculptor Armondo Battelli. c. 1870. Wesley United Methodist Church is one of Leflore County’s oldest churches and was organized by an African-American. Provides habitat resources for more than 250 songbirds, wading birds, waterfowl and raptor species. Burial site of legendary bluesman Sam Chatmon. Born in 1899, Chatmon played with two of his brothers in the influential blues band, the Mississippi Sheiks. He died in 1983. Corner of Second St. and Church St.
B.B. King often played for tips on this street corner as a young man in the 1940s, and in the 1980s he placed his footprints and signature on the sidewalk. Mississippi Blues Trail marker on-site. Drive-by. The rich cultural heritage of the Mississippi Delta and the life of bluesman B.B. King are told in this state-of-the-art museum through film, interactive exhibits, artifacts and activities. Gift shop. Admission. Group rates available. Gravesite of Charley Patton, the founder of Delta blues. Mississippi Blues Trail marker on site. Corner of Westside St. and College St. Originally a two-story house built in Carrollton. The house was brought by train to Indianola in the early 1900s and reconstructed on this site. One of many historic homes in town, many with signs that denote building date. Drive-by. Club Ebony has featured some of the world’s greatest blues artists, including B.B. King, who has performed here each year after his homecoming concert in Indianola. Open for tour groups and special events. Craig Claiborne, longtime food editor at the New York Times and a celebrated chef and cookbook author, grew up in this 1930s home where his mother ran a boarding house. Drive-by. Local art and pottery fill the walls of this nationally known restaurant, home of Taste of Gourmet. Award- winning smoked catfish pate and other packaged food shipped all over the world. A Delta lunch tradition since 1976. Located next to the B.B. King Museum, Gin Mill Galleries is both a restaurant and gallery of Delta culture and heritage. Live music on weekends. In the early 1900s, Front St. was the location of the pharmacy of A.R. Walker, the first African-American pharmacist in Mississippi. At 104 Front St. is Planter’s Bank, with an old-fashioned clock tower, built in 1905. At 114 Front St. was the town’s first automobile dealership in 1916. The street is now lined with shops, art galleries and restaurants and is featured in the opening scene of the movie, The Chamber, which was based on John Grisham’s novel. The courthouse on the corner of Second and Court is featured in the film as well. Drive along this uniquely beautiful cypress bayou running through historic downtown Indianola onto Westside Dr., passing Heathman Plantation and Holly Ridge as it crosses Hwy. 82. A new sidewalk trail extends from Fletcher Park on Main St. into downtown. Site of the home of Irene Magruder (1898 - 1973), the first African-American in Indianola to open her home to civil rights workers during Freedom Summer in 1964. All-day viewing. Faisonia Ave. and Gresham St.
Minnie Cox was the first known African-American postmistress, appointed by two presidents. She was postmistress of Indianola twice between 1891 and 1904. A historical marker and park are on the site where her home stood. The post office was dedicated to her in 2008. 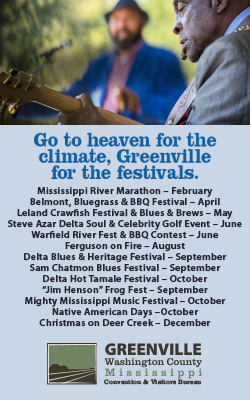 Seasonal boat trips on the Mississippi, Yazoo and Sunflower Rivers and local oxbow lakes. Bald eagle nest tours and swamp tours in local cypress/Tupelo brakes. Native American Mound Builder tour (with stop at Jaketown Museum) and Harvest Tours. Guided canoe trips, duck, dove and goose hunting, white-tailed deer watching and wildlife photography. Commemorates the Delta boyhood of Jim Henson, creator of the Sesame Street characters, and his delightful Muppets. Kermit the Frog is displayed along with other Henson memorabilia. Gift shop. Free. Donations accepted. For more information, contact Dot Turk or Ashley Zepponi. The bank and flood basin of Deer Creek once supported thriving steamboat commerce. Today, it is the site of some of the most fertile soil in the world. Washington is Mississippi’s largest cotton-producing county. This region also boasted an agriculturally based Indian culture, which thrived as early as 1200 AD Visit “The Rainbow Connection Bridge” in honor of The Muppets creator Jim Henson. Located in the old Montgomery Hotel, it honors the mid-Mississippi Delta bluesmen and their contributions to music. In the heyday of the blues, over 150 bluesmen lived within a 100-mile radius of Leland. Mon - Sat, 10 a.m. - 5 p.m. Admission. James Thomas, one of the favorite sons of the blues, is buried in Bogue Memorial Cemetery, in front of Greater St. Matthew M.B. Church. Free. Murals, painted by local artists such as Cristen Craven Barnard and Jay Kirgis, depict blues musicians from the Leland area. Jimmy Reed, Little Milton, Eddie Cusic, Willie Foster and James “Son” Thomas, as well as many other famous musicians, are included. One of the last authentic rural juke houses, Po Monkey’s welcomes visitors every Thursday night. This site is now part of the official Mississippi Blues Trail. In 1954, Lee and Pup McCarty began what was to become an internationally recognized and award-winning pottery business. The McCartys are recipients of the Lifetime Achievement Award from the Mississippi Institute of Arts and Letters and have had their work shown in museums and galleries around the world. The gardens of McCarty Pottery have garnered international acclaim. Feb - Dec, Tue - Sat, 10 a.m. - 4 p.m. Gift shop. Free. Trail features five new historical markers in the downtown historic district along the old railroad bed. In 1887, former slaves of Jefferson Davis’ brother, Joseph, formed their own community called Mound Bayou. I.T. Montgomery was one of the town founders. Drive-by. Pottery capturing the rich earth tones of the Mississippi Delta, handcrafted by the talented Woods Brothers of Mound Bayou. Open year-round. Mon - Tue, Thu - Sat, 10 a.m. - 4 p.m. Gift shop. Free. A premier, national caliber motocross track located north of Prentiss and features the perfect terrain and soil composition for motocross. The oldest continuously inhabited settlement in Jefferson Davis County. African-Americans purchased the land in the early 1900s and maintained a thriving self-contained community. By appointment. Open Nov - Apr. Campground with water, power and sewer. Inside horse stables. Two blocks from Longleaf Trace and equestrian trail. 9 miles from Prentiss. Managed by the Mississippi Department of Wildlife, Fisheries and Parks. The lake is open to the public daily. The second-oldest church and African-American cemetery in Jefferson Davis County. Guide available. By appointment or Sat, 8 a.m. - 1 p.m.; Sun, 9:30 a.m. - 1 p.m.
c. 1926. In 2013, the Rosenwald School Building, remembered for its historical, cultural and educational significance, was restored. Oldest Baptist church and African-American cemetery in Jefferson Davis County. Catch a glimpse of wood ducks, great blue herons and alligators. Wooded sloughs are home to the cottonmouth, mud snake, speckled king snake and black-masked racer. Deer, barred owls, wood ducks and aquatic mammals can be seen year-round. A 4.5-mile hiking trail adjacent to a lake and continuing through the Overcup Oak Research Natural Area and the Delta National Forest. Open the month of October. A variety of pumpkins are grown on site; pick your own. Corn maze as well as children's hay bale maze and activities. Sat, 9 a.m. - 6 p.m.; Sun, 2 - 6 p.m.; Mon - Fri, appointment only. High probability of viewing wetland songbirds during migration and the breeding season. Deer, barred owls, wood ducks and aquatic mammals can be seen year-round. High water can limit access during late winter and spring. Closed to hiking Nov - Jan.
Beautiful, historic post-bellum home atop a ceremonial Indian mound. By appointment. These bears are carved annually as part of the Great Delta Bear Affair Festival and donated to the community. Chainsaw carved works of art scattered around town; maps available at the Visitors Center. Monument commemorates the life of the famous civil rights activist. Brochure available from City Hall. Drive-by. c. 1901. A designated Mississippi Landmark, this historic depot was built by the Yazoo & Mississippi Valley Railroad. 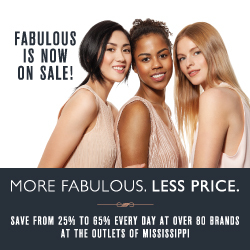 Mon – Tue, Thu – Fri, 9 a.m. – 5 p.m. In 1939, Tinsley Oil Field was the site of the first discovery of oil in Mississippi. For a time, it was a major source of oil in the United States. Drive-by. Gold Strike Casino features 1,133 deluxe hotel rooms and 50,000 sq. ft. of gaming space. The MGM Resorts International Property includes five restaurants, two bars and the 800-seat Millennium Theatre. An iconic Delta cafe located in a farm commissary built in 1926. Excellent food and full bar service. Hollywood Casino has over 1,100 exciting slot machines and more than 25 table games in 54,000 sq. ft. of gaming space. 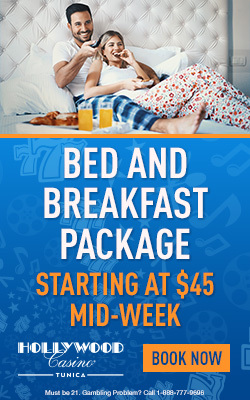 Guests can enjoy three restaurants, movie memorabilia, golf and an indoor pool while staying in the 494-room hotel. Home of the best odds, highest limits and biggest jackpots with the new Spa at Horseshoe, outdoor pool, six restaurants and big-time entertainment. 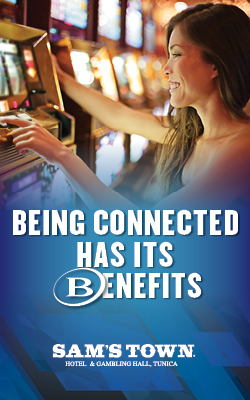 24-hour gaming facility, 201 rooms, smoking rooms, restaurants, lounges, entertainment and senior discounts. Located in a sweeping bend in the Mississippi River, River Bend Links offers golfers a chance to experience the simple beauty and peacefulness of the Mississippi Delta. 24-hour gaming facility. 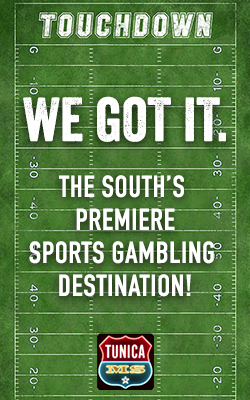 Non-stop casino action, with everything you love about the South: generous portions of down-home cooking, the brightest stars in country music and famous Southern hospitality. 27-mile bike trail from the town of Tunica to the Desoto County line and a 13-mile trail from downtown to Mhoon Landing Park. Activity area, primitive camping and picnic area. Free. Discover the culture, history and nature of the Mississippi River at a Delta favorite. Enjoy a Mississippi River Museum, outdoor nature trails, picnic areas, breathtaking views. Museum and gift shop. Tue - Sat, 9 a.m. - 5 p.m.; Jun - Oct: Sun, 1 p.m. - 5 p.m.; Closed Mondays and Christmas Day. Cowboy up for rip-roarin' fun with over 1,300 slots, 36 table games, pool tables, drink specials, live entertainment and spacious hotel suites. The Tunica Sports Complex is “the place to meet and compete,” featuring an aquatic center, baseball/softball fields, basketball courts and professional boxing facility. Mon - Fri, 8 a.m. - 8 p.m.; Sat, 8 a.m. - 6 p.m.; Sun, 1 - 6 p.m.
Beautiful park with life-size bronze statues. Plaques represent all areas of service. Open year-round. Free. Walking tour of downtown Tunica. There are 13 bronze plaques on historic buildings. Locations are on Main St., Edwards Ave. and School St. Free. Visit Delta Pecan Orchard and follow the process of gourmet pecan production, harvesting, cleaning and roasting. They also make pecan pies, breads, cakes and cookies. Mon - Fri, 8 a.m. - 3 p.m.; Sat - Sun, by appointment. Free. Founded in 1835, the two-story building was built in 1874. Upper story once housed the local Masonic Lodge. It fell in 2007 and was rebuilt as a single story. Daily, dawn to dusk. Drive-by. Built in 1876 of bricks with Gothic architecture. The walls are paneled with curly pine. Memorial windows depict the Madonna and Child and episodes in the life of Christ. Daily, dawn to dusk. Drive-by. Historic cemetery contains graves of approximately 50 Civil War soldiers. The oldest graves date back to 1837. Dr. C.M. Vaiden’s grave is marked by an elaborate tombstone. Built in 1943 with WPA funds focused on education and architecture. The state’s first hospital serving African-American Mississippians. Founded by Thomas J. Huddleston Sr., a prosperous black entrepreneur and advocate. Drive-by. The oldest public library building in the state still in use, also designated a Mississippi Literary Landmark in recognition of its association with author Willie Morris. Rotating historical exhibits. Mon - Thu, 8:30 a.m. - 5:30 p.m.; Fri, 8 a.m. - 5 p.m.; Sat, 8:30 a.m. - 12 p.m. In 1864, Union forces defended Yazoo City against Confederate forces led by Generals Lawrence Ross and Robert Richardson. The Third US Colored Calvary helped defeat Confederate forces. Historical marker. This historic road, sunken from traffic since the 1820s, was widely used during the Civil War. Today it resembles the old, sunken Natchez Trace. Open daily. Organized in 1868, Bethel is the oldest African- American congregation in Yazoo City. After affiliating with the African Methodist Episcopal Church, the congregation moved to this site in 1890. Tours available. Trolley tours available. Two-, three- and four-day packages with Main Street Hotel stays and personalized tours of the Delta. Schedule in advance. Admission. Based on Willie Morris' book, come explore Yazoo City and Glenwood Cemetery through the eyes of young Morris. Costumed storyteller tells the story of "The Witch." Schedule in advance. Admission. Mt. Vernon M.B. Chruch was organized in 1870, and was the first African-American Baptist congregation in Yazoo City. Mt. Vernon features stained-glass windows, balcony with Gothic lettering and stairway. Brings together the county’s diverse past. Fossils dating back 45,000 years, Native American relics, Civil War history, African-American history, famous Yazooans and Governor Haley Barbour Collection. By appointment. 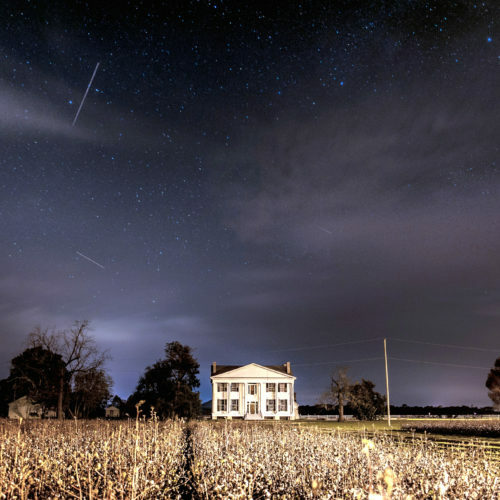 Cotton, catfish farming, local honey farms, a 250-acre working ranch; visit a cotton gin and catfish plant. Seasonal. By appointment. Groups of 30+. Fees apply. Antebellum, Queen Anne and Victorian architecture in the historic business and residential district. 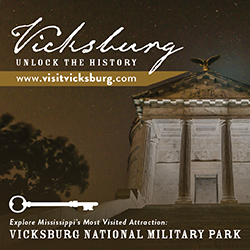 Brochure available at the Yazoo County Convention and Visitors Bureau. Daily. Drive-by.